Mix a 150g carton natural yogurt (wholemilk or low-fat) with a squeeze of lemon juice, about 1 tsp olive oil, a sprinkle of sea salt and freshly ground pepper and 1 tbsp (or more, if you like) of freshly chopped mint. This deliciously simple dressing can then be used to bind cold new potatoes with lightly cooked and cooled peas or petits pois. Add a bit of watercress too to create a summery salad. 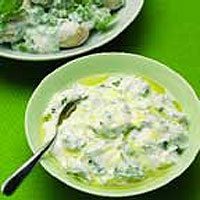 Alternatively, use the minty mixture as a light dip for crunchy crudités, or add a cooling dollop to a plate of grilled fish or meat.